We like to think that we live in the most advanced country on earth. This may have been true in the two decades following WWII when almost all of our developed country competitors were recovering from that disaster. 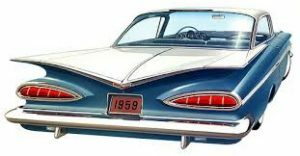 In the 1950s we built the interstate highway system and hugely expanded air travel. Our telecommunications system were state of the art. TV and radio covered the country. Cars got bigger and flashier every year. Once could go on to enumerate how dynamic and modern America was. 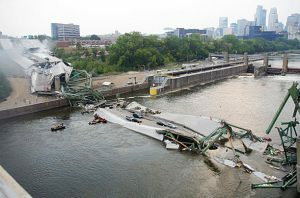 8/1/2007, Interstate 35W bridge Minneapolis collapsed. We have always been in thrall of the new. Innovation is so highly prized that one can hardly find the mention of maintenance any where. It also fits with the free market neoliberal hatred of government. This ideology, discussed at length here, starves maintenance across the board. Free market capitalism provides no resources on its own for the maintenance of public infrastructure. Now when one returns from a trip to another developed country, you can even venture north to Canada to experience this, you return to the US and immediately have the feeling of slipping into a third world country. Roads falling apart. Airports crowded and slovenly. Bridges in disarray and occasionally literally falling down. Schools and public buildings that are worn out. Even though it might be a bit self-serving coming from the American Society of Civil Engineers, they report a “D+” for infrastructure for 2017. 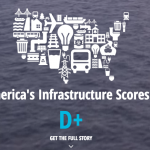 The American Society of Civil Engineers has released another of their series of infrastructure report cards. The 2017 report card shows a “D+”…….